I caved in and bought the MUA Constellation in Libra all because MUA were having a 35% off with free postage sale! 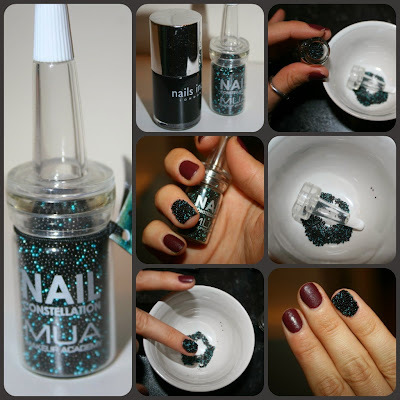 As you can see from my photos i had a Nails inc leather effect on most of my nails, and when the embellishment came off (from when i went to their event) i decided to paint the ring finger in Black taxi from Nails inc.
Whilst nail is wet pour on beads over a small dish so you don't waste any. Gently pat the nail to make sure beads are secure. Pour on more beads if needed. wait to dry, then apply a top coat (not a quick dry as i found it discoloured the beads! I think they came out really nice, although not that practical unless you have a top coat. I think i would definitely try out the other colours like Pisces, which i think would be nice for spring time. This cost me £3 which is quite cheap considering you can get quite a few uses from it if you use it as an accent nail. They go out of stock pretty quick on the MUA store so might be worth checking your local superdrug, i know mine is having a 3 for 2 sale and these are included so you can save yourself a bit of moolah, be good little presents for friends. Another thing worth mentioning is that these are surprisingly easy to remove with nail varnish remover, i just held the cotton pad there for a few seconds and they just came off... a lot easier than glitter! Be part of the Daxon network! Oh MUA how you upset my bank balance..
Collection: #NOTD Hot looks Twilight!